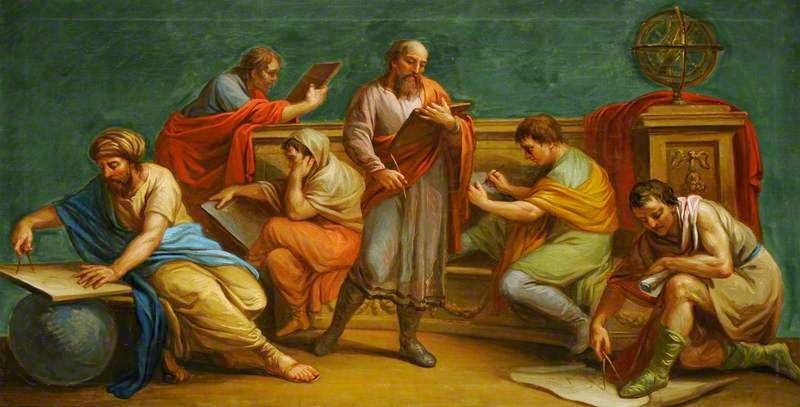 A Greek philosopher and his disciples by Antonio Zucchi. When you are supposed to produce something that has to be logical and consistent, like, let’s say… an ontology, you are probably expected to have a very theoretical approach to it. Probably, your colleagues imagine you sitting at your desk, dressed like an ancient Greek philosopher, creating categories that describe reality. This is definitely a sensible and fruitful approach. It ensures a better level of consistency and it is likely to generate a more solid piece of knowledge modelling. Nonetheless, I have the feeling that what is really missing from the existing ontologies on cultural heritage are the specific issues that become apparent only in the very process of modelling or imaging. Even for 3D modellers it is easy to overlook some aspects of the work when they are not actually modelling but just thinking about modelling. I will need to wear the philosopher's clothes when this phase is finished to make everything more homogeneous and (hopefully) fill the gaps. So, I have decided to take a different approach: instead of "from general to particular", I’m going in the opposite direction. Looking at what I actually do, I have started drafting what is the information that, in my opinion and experience, is important to express in linked data. We can call it a more experimental, or laboratory-style approach. Deductive and inductive methods are both valuable and needed, maybe at different stages. At the moment, I am completely immersed in the second one. The idea is that it would make the ontology closer to the actual visualisation process, from the research to the production of the output. However, the particular-to-general approach has also its drawbacks. I keep changing things when I realise that there are aspects of the process that I had neglected, or not covered in the right way. I add, change or delete attributes very often. Let’s say that I'm working for subsequent refinements. This obviously very much compromises the consistency of my work. I fully expect to spot quite apparent logical gaps only at the end (I bet, just after having submitted my thesis...). So I am now wearing (ideally) my lab coat and I am fully in the experimental mood. I have started from the relatively easiest of my layers, the one that visualises the Iseum as it might have been in the period before the eruption (but after its restoration). I think I have started identifying quite clearly some of the recurrent processes in virtual archaeology and 3d visualisation. Of course, everything is at work-in-progress stage: classifications. Concepts. Actually even labels and, generally, names.